MonarchLIVE visited the Monarch Butterfly Biosphere Reserve for the first-ever live broadcast / webcast from the Sierra Chincua sanctuary where monarch butterflies overwinter. Sierra Chincua is one of only a few mountain peaks in the Mexican states of Mexico and Michoacan in which monarch butterflies overwinter. This is the first time that a live television program or webcast has come live from the Monarch Butterfly Biosphere Reserve. CLICK HERE to watch the webcast. The eastern population of North America’s monarchs overwinters in the same Mexican mountain areas every year from October to late March. Monarchs roost for the winter in oyamel fir forests at an elevation of 2400 to 3600 meters (nearly two miles above sea level). 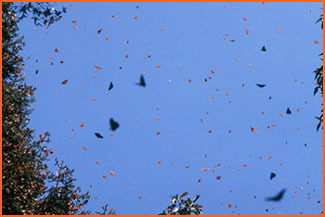 The mountain hillsides of the oyamel forest provide an ideal microclimate for the butterflies. Here temperatures range from 0 to 15 degrees Celsius. If the temperature is lower, the monarchs are forced to use their fat reserves. The humidity in the oyamel forest assures the monarchs won’t dry out allowing them to conserve their energy. Conservation of overwintering habitat is very important to the survival of monarchs. In 1986, the Mexican Government recognized the importance of oyamel forests to monarch butterflies and created the Monarch Butterfly Biosphere Reserve. In July 2008, the Monarch Butterfly Biosphere Reserve was named a World Heritage site by the United Nations Educational, Scientific and Cultural Organization (UNESCO). Check out the lesson plans and links. Journey North has information about monarach’s overwintering season.